This is the best duck recipe I know. This recipe came about as a result of my quest to enjoy the famous Chinese dish known as Peking Duck. Every restaurant version I had was disappointing, so I decided I would have to make it myself. The key to a great Peking Duck was supposed to be a very crisp skin over moist, tender meat. All the recipes contained methods for achieving crisp duck skin. The classic way of doing this was to cut a small hole in the skin, insert a straw into the hole and blow through the straw until the air caused the skin to separate from the meat, which was supposed to dry the skin. This did not appeal to me. Other recipes suggested using a bicycle pump to inflate the skin. I did not find that very appetizing either. 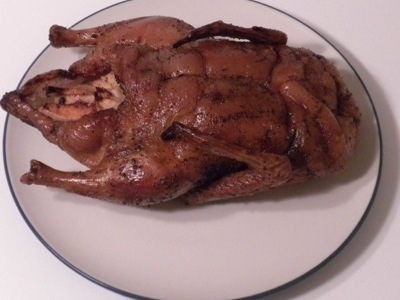 After the skin was inflated, the duck would be painted with a marinade, then hung up to dry in a cold, drafty place. I did not have a cold drafty place. Some recipes suggested hanging the duck in front of a powerful fan (which could result in droplets of marinade being sprayed all over the room). One even suggested using a hair dryer. I didn’t like any of these methods either. Finally, I ordered duck at a Vietnamese restaurant. The skin was crisp and delicious. I asked the cook what she did to get the skin so crisp, and she pointed to the refrigerator (her English wasn’t very good). I finally figured out that it was possible to dry the duck skin by placing it in the refrigerator. This I could do. Another problem I had was with the marinades used for Peking Duck. All of them were loaded with sugar and soy, two substances I avoid eating. After much experimentation, I finally hit upon the perfect combination: Vietnamese refrigerator drying; Chinese roasting techniques; and Polish flavorings. This results in a duck that is truly heavenly. 1.2 or 3 days before you plan to cook the duck, prepare it for drying. Remove everything that is inside the cavity of the duck, including any large pieces of fat. Rinse the duck inside and out with filtered water, and dry thoroughly. Place the duck on a rack in a shallow roasting pan. Place the uncovered duck on a refrigerator shelf (not the meat compartment), and let dry for 2 or 3 days. 2.Put one rack in your oven in the second lowest position. Preheat the oven to 450 degrees. Remove the duck from the refrigerator. Place the duck on a rack in a roasting pan that is at least 2 inches deep. The duck will release a lot of fat, so it is important that the roasting pan is deep enough to avoid any spillage. 3.Mix the salt, garlic, and marjoram together, and rub this mixture all over the duck inside and out. Stuff the duck with the apple pieces. When the oven is preheated, place the duck in the oven and cook for 30 minutes. This may generate a lot of smoke, so it is best to turn the fan on. 4.Carefully remove the roasting pan from the oven, being aware that there will be a lot of hot fat in the pan. Carefully remove the duck from the rack and put it on a plate. Remove the rack from the pan. Carefully pour the duck fat into a large heatproof bowl. Return the rack to the pan and place the duck on the rack. Pierce the skin of the duck all over with a large fork. 5.Return the duck to the oven, and turn the heat down to 325 degrees. Cook for 1 hour. Remove the duck from the oven and serve.